great in virtue and rich in miracles, in times of need. God has given such great power to come to my assistance. Saint Jude pray for us and all who invoke your aid. Saint Jude offers swift intercessioan and profoud assistance in desperate and diffcult cases. He can assist with financial blessings as well as many other kinds of support. All Services are personal to my philosophies and techniques which have been developed over twenty years of practice. This is a Spiritual Service in which the main candle used is a 7 day Vigil Candle. 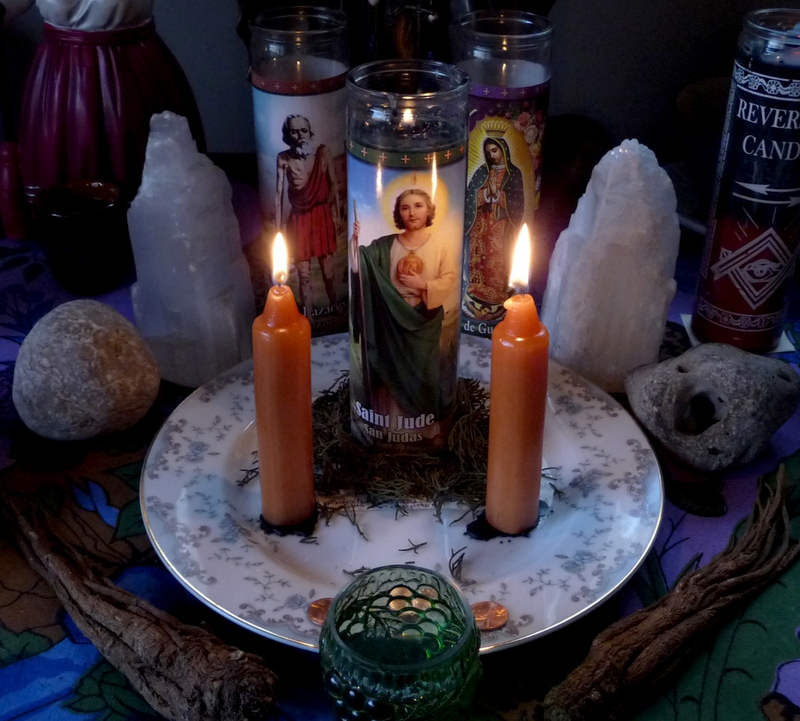 After the initial Service is performed, your Vigil Candle will remain on my altar until it is fully extinguished. Until that time you and your goal will remain in my prayers and meditations. I will continue to work this candle each day until it burns out. Spiritual Services differ from basic spell work. In this Service Saibt Jude will be venerated, honored, and praised through offerings, prayers and dedications. He will be petitioned to assist me with my Spiritual Work and to assist you with your goal. This is a form of channeling, invoking or conjuring. It involves a deep connection with Spirit. Prayer, paper petitions, meditations and energy work will be performed for you. Using Spiritual connection I will intercede on your behalf. Through Spiritual Channeling I will direct blessings and good luck towards your endeavors. Don't hesitate to drop me a line if you have questions about this or other services, I'm friendly and look forward to meeting you! To see my client feedback click on my Testimonials. At the time of checkout please comment in the box provided with your full name (including middle names & maiden names, etc), your date of birth, and your current situation, petition or goal. Photos are not mandatory, but can be helpful. After checkout you will receive further instructions from me as well as a scheduled date for your Service. "I received so many job calls for new employment."